Note: All present-tense mentions (the British Bombs currently in service, etc) refer to the at-the-time current 1946 Technical Manual. British bombs are designated by purpose, weight, and mark number. British mark numbers, which are always written in Roman numerals, correspond roughly to the modification numbers used by the US Navy, while the British weight designation corresponds to the US Naval mark number. Minor changes in marks of British bombs are indicated by various symbols, consisting of lower case letters, capital letters, or asterisks. The classification according to purpose is generally indicated by the initials of the specific type. Thus, there is a series of antisubmarine bombs designated "A.S.", a series of general purpose bombs designated "G.P. ", semi armor-piercing bombs designated "S.A.P. ", aircraft depth charges designated "D.C.", etc. Occasionally, when no appropriate initials can be used, the complete name of the bomb type is employed in the designation, as "Smoke", "Practice", etc. Therefore, in order to describe a British bomb completely, the use, weight class, and mark number must be given in that sequence; eg, GP 250lb Mk V; IB 80lb Mk IV; Smoke 500lb Mk I; SAP 500lb Mk IIC. British bombs generally are highly streamlined, although the later designs, such as the MC bombs, are parallel sided, resembling the American GP bombs in external appearance. GP and MC bombs are usually of cast, one-piece construction, although some MC bombs may be built up in welded sections of cast or forged steel. SAP and AP bombs are always forged in one piece and heat-treated for greater strength. The exteriors of these bombs are well machined. 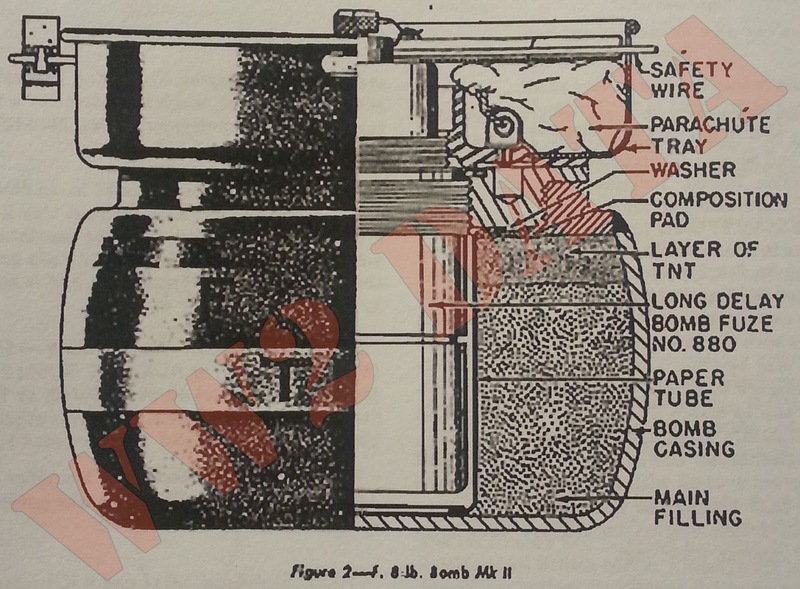 HC bombs are of thin-walled, "boiler plate", construction. A great variety of main fillings are used by the British. The most common, however, are the following: Amatol for GO, MC, and HC types; TNT for SAP; and "Shellite" for AP bombs. RDX/TNT combinations are also commonly employed in MC and HC bombs. Current fillings are 60/40 Amatol HC, and desensitized Pentolite or RDX/TNT for all others. British bombs are suspended by a single suspension lug attached to the bomb body by machine screws. Later designs of British bombs, such as the MC series, are fitted with additional dual suspension lugs for carrying in American planes. Crutches or sway bars are used with larger size bombs. A unique type of tail assembly is regularly employed by the British, consisting of a sheet-steel cone with a cylindrical strut attached by means of four sheet-steel fins. The unique feature is the fact that the arming vanes are an integral part of the tail assembly. They are attached to the tail pistol by means of a reach rod with a fork on its lower extremity engaging a similar fork on the tail pistol. A special short trail,. originally designed for use in American built planes, is sometimes used to permit a greater bomb load. A third type of tail assembly, rarely used, is designed to be employed in conjunction with certain tail fuzes which have their own arming vanes. The arming vanes on this tail assembly are omitted, and the tail cone is truncated to give clearance to the vanes on the fuze. Tail units are attached to bombs up to 1,000 pounds by a spring clip assembly, and to bombs of 1,0000 pounds and over by means of bolts. Since each individual bomb is provided with its own specific tail unit, the bomb designation and tail number, which are stencilled on one of the tail fins, serve as a ready means of identifying the bomb. The word "Mark" is omitted from both the tail unit and the bomb designation. For example, the tail unit, No. 2 Mk I, used on the GP 500lb Bomb Mk IV, should appear on the tail unit as "No. 2 . 1, GP 500lb IV". The following list gives the color markings employed on loaded British bombs. F ------ Dark green overall with red band forward of light green band on nose. GP ------- Dark green overall with red nose band and light green body band. MC ------ Dark green overall with red nose band and light green band on base of ogive. HC ------ Dark green overall with red nose band and light green band on forward portion. SAP ------ Dark green overall with a white band just forward of a red band on the nose. DC ------ Dark green overall with red nose band and colored band indicating filling forward of the suspension lug. B ------ Dark green overall with red nose band and green band on ogive. IB ------ Either dull red overall or have red nose end. Most small sizes have a bright red band between two black bands around the nose. Large sizes have a bright red band on the body and another on the after body. Smoke ------ Dark green overall with a red band either around the nose or the after part of the body. Practice ------ White overall with two green bands around the tail cone. TI -- Black overall with red band at base of ogive. Color of band around nose plug indicates the color of the candles. A red cross on the after part of the body indicates that explosive candles are used. Flares and Photoflash ------ Black overall with a red band near nose. Cluster projectiles ------ Painted an overall color according to the type of small bombs carried. HE filled bombs were originally painted yellow by the British. The change to dark green was made at about the same time that the United States change to olive drab. Consequently, yellow-painted bombs may still be found. 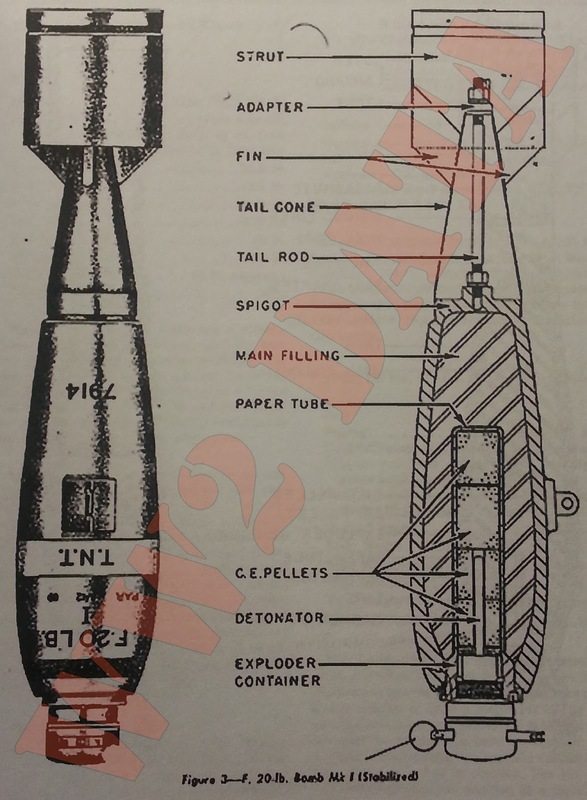 Complete information, including weight, type, mark number, filling, date filled, filling station and lot number will be found stencilled on the outside of all British bombs. Although the location of the various stencillings differs with different bombs, the following sketch will indicate the information to be found and its approximate location on the outside of the bomb body. There are only two sizes of fragmentation bombs now in use by the British. These are the 8 pound, and several different marks of 20 pound fragmentation bombs, including a modified US 20lb fragmentation bomb. 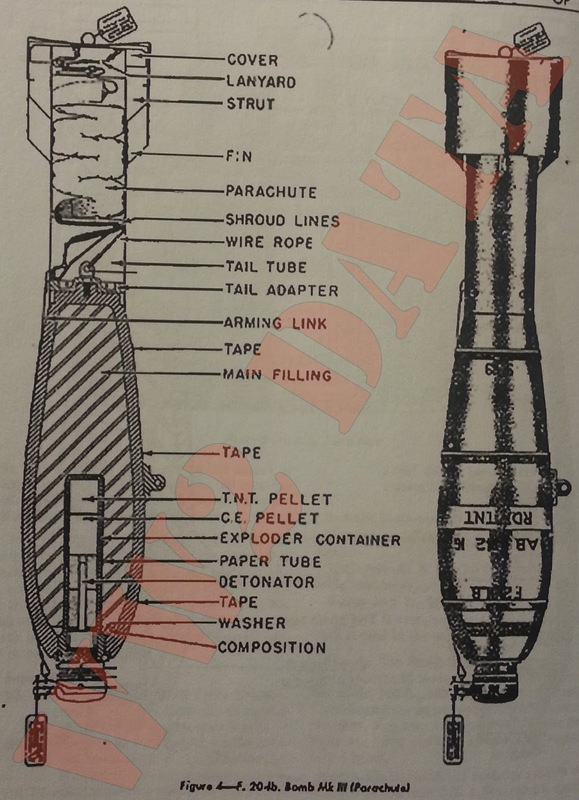 The 20lb F bomb is nose fuzed only, and is similar in construction to the 40lb GP bomb. It may be fitted with a standard tail for purposes of stabilization, or either a standard parachute attachment, or a special small parachute for use with a 500lb Cluster Projectile No.17 Mk II may be used. The parachute attachments are designed to reduce the bomb's terminal velocity and so insure detonation of the bomb on impact before ground penetration takes place. Fragmentation bombs are generally painted dark green overall with a red band and a light green band around the nose end. These fragmentation bombs are used principally against personnel. 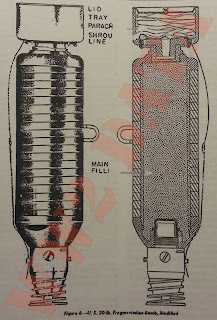 Body Construction: The bomb body consist of a pot-shaped, cast-steel cylinder which is open at the top, A steel neck ring, having internal threads to receive the adapter, is welded to the open end of the body. The parachute tray is secured to the adapter. Extending through the adapter fuze, which is enclosed by a paper tube 2 inches in diameter, extending through the bomb body. Parachute: The parachute is 12 inches in diameter and is encased in a cylindrical steel tray having a diameter slightly less than the maximum diameter of the bomb body. A safety pin extends through the parachute container, and is secured by a spring clip. Remarks: The Mk I Bomb has a smaller filling hole than the Mk II. The Mk I was never fitted or adopted for service use. 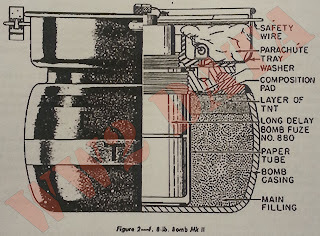 Body Construction: This bomb has a stream-lined, one-piece, cast-steel body, with the nose end open to take the exploder container. The rear end is reduced to form a spigot for taking the tail assembly. The boss on the spigot is tapped and threaded to receive the tail-securing rod. The exploder container is cemented in position, and locked by a locking screw. Tail Construction: A cylindrical strut is attached to the tail cone by four fines. The tail is secured to the body by a tail rod screwed into a boss on the body spigot, and passing through a threaded adapter on the narrow end of the tail cone. The locking nut and spring washer at both the outer and inner ends of the rod lock it in position. -Mk I: Carried 12 in Small Bomb Containers, or on Light Series bomb carrier if fitted with a suspension lug. -Mk II: Carried 12 in Small Bomb Containers, or on Light Series bomb carrier if fitted with suspension lug or band. -Mk III: Suspension lug welded on bomb body at center of gravity for carrying on Light Series bomb carrier; can be carried 12 in Small Bomb Container. Main Filling: 3.3 pounds of TNT or RDX/TNT (When RDX/TNT is used, a 1/4 to 3/8 inch topping of TNT is used in the nose. Remarks: The Small Bomb Container, 160lb, contains eight of these bombs. The Small Bomb Container, 250lb, will hold 12 of these bombs. These bombs are no longer being manufactured. However, they may be encountered in the field. They are being replaced by the 8lb fragmentation bomb. 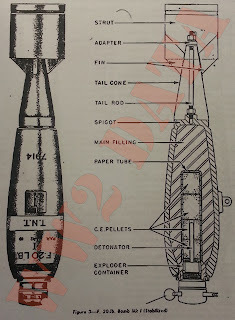 In the Mk IV Bomb the exploder system was changed to use only CE pellets, and a special retarded tail was incorporated. Tail Construction: The parachute tail unit consist of a tail tube with a cylindrical strut connected to its rear portion by four fins. The parachute, which is housed in a fabric cylinder, is contained in a tail tube. A loose-fitting metal cover in the after end of the tube is attached to the fabric cylinder. The parachute cords are connected to a wire rope secured to an eyebolt which connects the tail adapter and the body. The tail adapter is secured in the front end of the tail tube by four screws. When dropped, the metal end cover in the tube is blown off by the air slip, and acts as a pilot parachute to pull the main parachute out of the tube. Body Construction: This bomb has a stream-lined, one-piece, cast-steel body, with the nose end open to take the exploder container. The rear end is reduced to form a spigot for taking the parachute attachment. The exploder container is cemented and locked in position. The No.873 Nose Fuze is locked in position by a multi-tab washer. Tail Construction: No tail is used with this bomb, which is especially designed to be used only in the No. 17 Mk II Cluster. 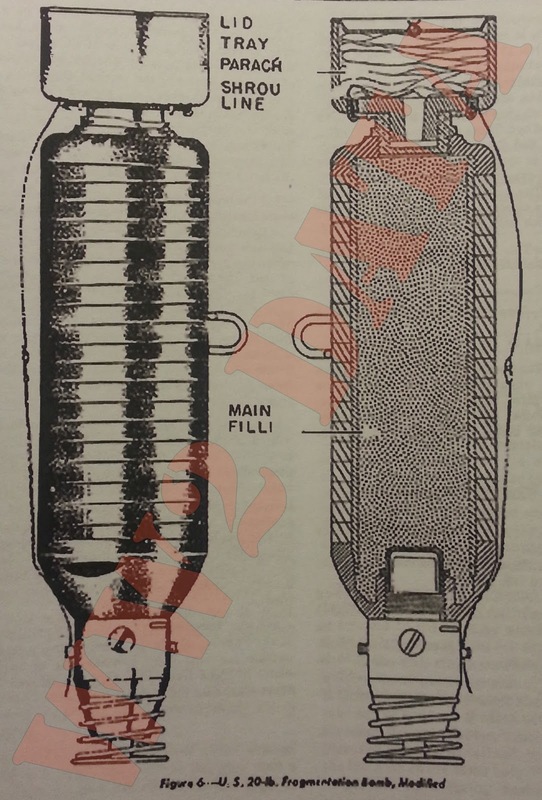 It has a short parachute attachment, secured to the body spigot by a threaded stud. The parachute tray houses an 8 inch diameter fabric parachute with six pairs of rigging lines; each pair terminating in a whipped eye. These eyes pass through holes in the tray and are threaded onto a metal circlip(? ), which is secured on the underside of the tray. A lid over the parachute in the ? held in position by the fuze of the bomb behind it. When the cluster opens, the air slip displaces the lid, which pulls the chute free of the tray. Suspension: This bomb has no suspension lugs, as it is used only in the No. 17 Mk II Cluster. Explosive Components: Two TNT, and two perforated CE pellets. Remarks: The bomb is issued only in clustered form, and, when clustered, the fuze has no safety pin fitted. Hence, care should be exercised in dealing with any individual bombs which might break loose from a cluster in handling. 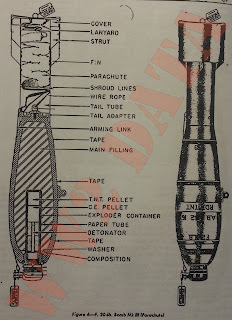 Body Construction: This bomb consists of a US 20lb Fragmentation Bomb, which has been altered by the attachment of a special British parachute housing. The bomb consist of a cast-steel nose and tail sections threaded to a seamless steel inner tube. Helically wrapped around this inner tube is a heavy, drawn-steel wire to provide effective fragmentation. The nose ? sections are threaded internally; the form to receive the nose fuze, and the latter to receive the parachute housing. Tail Construction: The British No. 14 Parachute Housing consist of a cast-aluminum tray containing a 12-inch diameter parachute. The tray is closed by a loosely fitting metal lid to which the parachute is attached by a short loop of cord. The shroud lines of the parachute are fitted through holes drilled around the bottom edge of the tray, and are secured by a metal ring passed through the loops of the lines. Leading from the parachute is an arming line, spliced to the arming wire from the fuze. Release of the parachute withdraws the arming wire from the fuze, allowing the fuze to arm after a few seconds delay. Suspension: Although the bomb is provided with a single, U-shaped, steel eyebolt welded to the bomb body for individual suspension, these bombs will be carried by the RAF in Cluster Projectiles No. 23 Mk I and No.24 Mk I. In these clusters the nose of one bomb bears against the parachute lid of the bone behind it, holding the lid in place until the cluster opens. The air slip then removes the housing lid, which acts as a pilot parachute and pulls out the 12 inch diameter parachute by which the bomb is suspended. 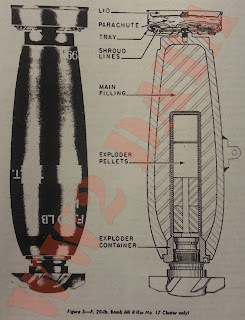 Remarks: Because of the extreme sensitivity of the Fuze AN-M 104, an extra spring, located outside the fuze body beneath the pressure plate, is added when this fuze is employed in these bombs by the RAF.